My boyfriend has been teaching himself Objective-C & how to develop iPhone/iPod Touch applications. He has now developed his first app called iWatcher, it's a Weight Watchers Points calculator. When I was looking in the App Store on iTunes I saw a lot of the reviews from people for the Points calculator complaining that those calculators only works for the United States, the needed Nutritional Information is different for Europe. I told Frank about this & he added the European calculator. If you use the European calculator tap on the European Points along the bottom which will bring you to this screen. Enter the "Calories" or "Kilojoules" and "Saturated Fat" & click go on the keyboard. European calculation uses either Calories or Kilojoules, not both, if you enter the NI in both fields you will get an error screen. Just click ok & delete one of the fields by tapping in the box. And last, here is a screenshot of the about page. It just basically tells you about this app & his email address where you can send suggestions & questions. 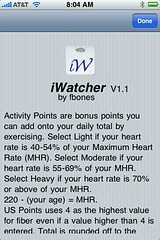 Added feature to iWatcher, Activity Points. 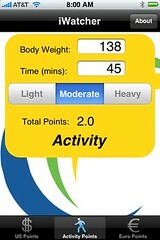 Calculate your activity points depending on your workout. The about page was edited too...it will help you figure out if your workout was light, moderate or high depending on your heart rate during your workout. I have a question. I love this app but have somehow set it up so that my week begins (for bonus points purposes) on Tuesday instead of Wednesday? Is there any way to change this w/o unintalling the App and losing all of my favorites?